I had to run naked today. Not that kind of naked! I love music, in all parts of my life, running included. I also am an information hound. I love to analyze my runs and know to the tenth of a mile how far I went and to the second how long it took me. I'm not a slave to it, but it always interests me. I did a short run tonight at 7:45pm. It's light until about 8:30pm right now, which I LOVE. I like to space my runs 24 hours apart and since I ran yesterday afternoon, I didn't want to get up early this morning. I went to grab the iPod to put my Nike+ adapter in...and it was missing, along with the remote for our iPod dock. I knew right away my 4-year old had done something with it because I remember her trying to play with the iPod the other day. I looked around for a few minutes but didn't see it, so you know I dragged her out of bed to find it! She said "I put it in a little box, but I don't know where it is." We looked in all her usual spots, and then we went to look around her room. She made a beeline for the closet and said "I know where it is." Sure enough, she pulled a small wooden box out of the back corner of the closet which held the iPod and remote. 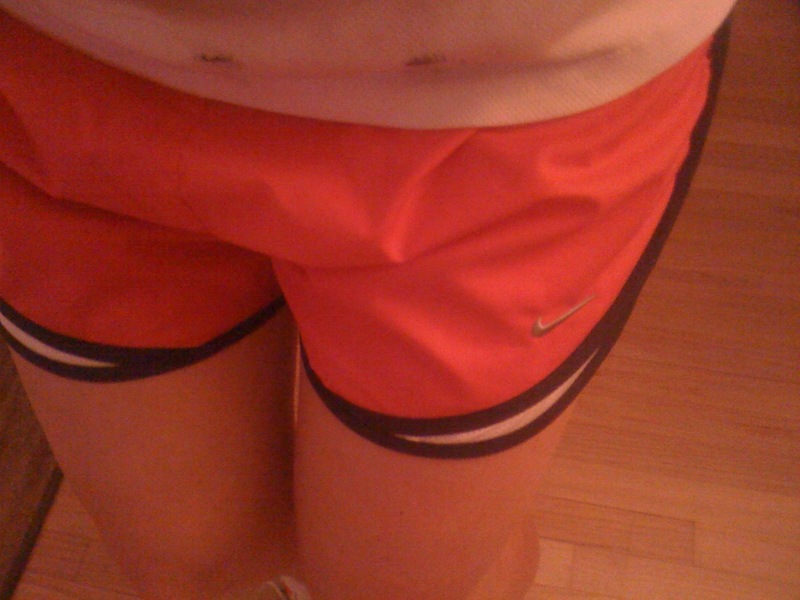 I got my first pair (actually three pairs) of Nike Running shorts. They make me feel like a real runner. I went to Macy's to try them on to find out what size to order and there were a bunch on the sale rack. When I scanned their price, they were less than $10!! Down from $28. Talk about a great deal! And I got a Nike running shirt and a tank top for under $15 each. 5 Nike running items for less than $50. And I had a gift card from my birthday! I've used them twice so far, and I'm liking them. I do have a bit of a chafing issue with my thighs, but it's not too bad with these shorts and I need to get some Body Glide anyways. They may also become my "around the house" shorts. I threw them on after work tonight since I knew I was going for a run and I wanted out of my work clothes, and they were comfy and cute. If you need some running clothes, run to Macy's and check out the clearance/sale rack. You never know!